Bagworm populations have exploded this summer with the increased rainfall in spring. Have you noticed small brown structures that resemble small pinecones hanging from your evergreens? Your plants could have bagworms. With all the rain and mild temperatures we experienced this spring and early summer, we’ve seen a big increase in pests such as bagworms. There is a wide range of trees and shrubs that serve as hosts plants for different bagworm species. Arborvitae, juniper, conifers, elm, live oak, maple, persimmon, sumac…and the list goes on. 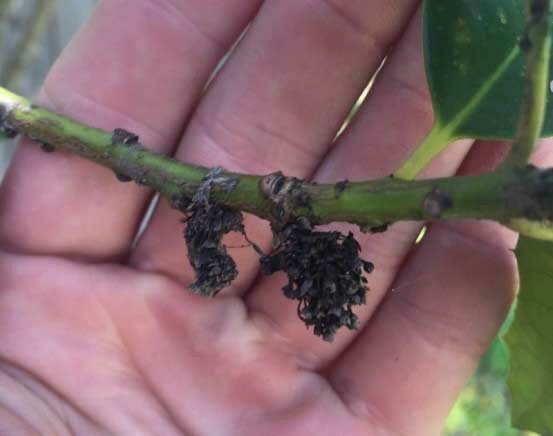 Once a host plant is infested it can quickly be defoliated and experience the same infestation year after year until the plant goes into decline. Deciduous plants tend to be able to handle the damage better than evergreen plants, as they have the ability to more easily generate new foliage. While there are several species of bagworms, we typically see the evergreen bagworm, Thyridopteryx ephemeraeformis, here in North Texas. The male of the species have wings, while the females do not. This is the reasons bagworms are not seen as often as other insects as it is hard for the females to move around or leave their host plant. To successfully move around, they either crawl very slowly with their casing, or are carried by the wind (called ballooning). Birds can also move the bagworms from plant to plant. Because bagworms generally stay on their original host plant, they can quickly defoliate the plant and reinfest it year after year. Bagworms spend the winter months as eggs inside the casings created by the females the previous fall. Each casing can have up to 1000 eggs in it. If you notice their casings on plants in winter, removing them by hand is the best way to prevent an infestation. In late-spring, tiny caterpillars hatch out of the eggs and find space in branches to create an upright casing. They will carry this casing around with them as they continue to develop. When they are small, they will leave their “bag” and move short distances to feed. In late summer and early fall, the male moths mature and begin seeking out the mature females. Female bagworms remain eyeless and legless their entire life and remain stationary strictly for breeding. The females remain in their bag where they will lay their new eggs. If you see bagworms on your plants the best control is to physically remove the cocoons by hand from fall through early spring. These cocoons may contain females and hundreds of eggs. Another good natural control is to release predatory wasps in spring. Trichogramma wasps will use the young caterpillars as a “nest” for their eggs and their larvae will eventually kill the bagworm caterpillars. There are certain natural insecticides that can be used on the young caterpillars in late-spring and early summer. Bacillus thuringiensis subsp. kurstaki (Dipel) and Spinosad are natural insecticides that can kill the younger caterpillars in their early stages.